(from Venues Today, September 24, 2013) The Centennial Olympic Park was built in 1996 as the center piece of the Olympic games, it’s 21 acres of green space located in the heart of downtown Atlanta. 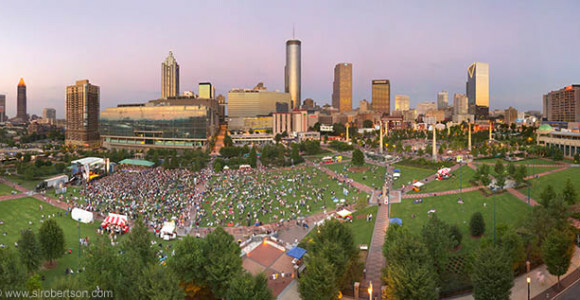 There have been no changes to the business model of the park since it was established, but soon Atlanta’s Centennial Olympic Park will be positioned to host more concerts and ticketed events. In the last several years, the park has added growth to the downtown area by attracting businesses, hotels, and restaurants. This expansion has resulted in questioning of the parks business model. Hosting profitable events will create a way for the park to be financially self-sufficient. The goal is to hold one big concert or festival a month from April to September to produce enough money to pay for the free events. On September 10th Mumford and Sons performed a sold out show; there was a fan count of 22,000 and tickets sold for $49.99. This accomplishment has lead to consideration of expanding the park to increase flexibility for more types of events. Julia Karrenbauer, director of business development says, “There’s a lot we can do, but it’s about finding the right mix and what’s best suited for the space and community.” The managers have been receiving a lot of calls, but often requests are for dates already scheduled. While the new goal may be to hold big events, the free events are of equal importance to the directors who are looking for a balance.